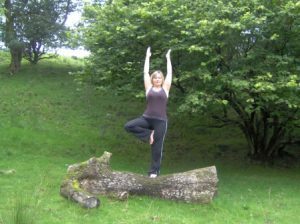 Sandra teaches an adult yoga class suitable for all ages from sixteen onward. This is a mixed ability class and is suitable for all levels and abilities as all postures can be modified and you will never be asked to do anything that you feel uncomfortable with! Classes begin with awareness of breath and sensations. Followed by a gentle warm-up sequence to free the joints and ease out any tight areas in the body. Then you will be guided through a series of postures to strengthen and stretch the body with the focus on breath awareness and we will finish with a guided relaxation to leave you feeling refreshed, restored and revitalised. Yoga helps to tone and strengthen the body, remove tension and stiffness, promotes better breathing and circulation and creates a natural feeling of calmness and inner peace. Through the practice of yoga you will develop self- awareness, self-acceptance, peace and love. Yoga is about being in the present moment, promoting peace and happiness through the mindful practices of yoga, breathing and relaxation. A tool which helps us to live happier and healthier lives.